Robert Burns Day is tomorrow. Time to celebrate the life of Scotland's most famous poet, and 'the greatest Scot of all time', according to a recent public vote by Scottish Television. 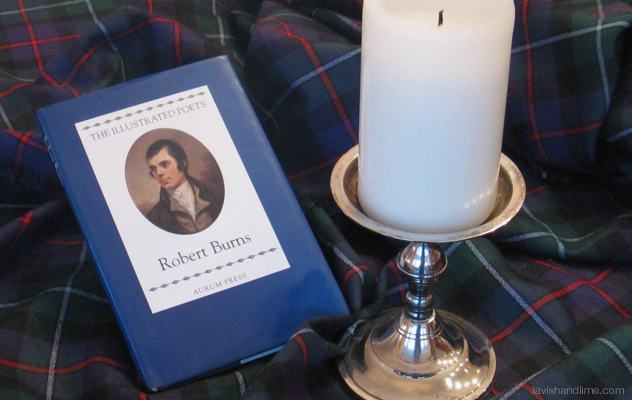 If you're hosting a Burns Supper or attending one tomorrow or even this weekend, here are five suggestions to keep in mind that can help make yours a more eco-friendly Robert Burns Day. 1. Eat the Haggis. If you're off offal, Haggis may not be for you, but Haggis contains sheep parts that are often thrown out so if you think about eating it as helping reduce waste, you might just get past the fact it contains sheep's 'pluck' (heart, liver and lungs). Dowsing Haggis with whisky can help too. 2. Wear tartan. If your kilt is at the cleaners, be sure to reuse a piece of tartan ribbon you already have and pin it on your lapel, wear it in your hair or incorporate it in your outfit somehow. Dressing to impress with a plaid shirt from your closet can work too. 3. Light candles. In keeping with Burns' reputation as a pioneer of the Romantic Movement, shun electric lights in favour of candlelight. Adorn your table with candles - not only will you be setting a softer, more intimate mood for your guests, but you'll be saving electricity too. 4. Read poetry. Open that old copy of Robert Burns poetry or borrow one from a friend, even the library and offer some good ol' fashioned live entertainment, without the electric gadgets. Aside from his famous Address to a Haggis, A Red, Red Rose and To a Mouse always do well. 5. Use Scotch on your nails. Don't go to dinner without fantastic nails and for this, go natural with the aptly named Scotch Naturals nail polish. With names like 'Kiltlifter' and 'Flying Scotsman', polish can easily transform your nails into your best accessory, especially at dinner where everyone sees them up close, in action.